tachyon Hypothetical elementary particle that has a velocity greater than the speed of light. According to relativity, the tachyon, if it exists, would be travelling backwards in time. No such particle has ever been detected, but some elementary particle theories allow for their existence. Taeduk Radio Astronomy Observatory (TRAO) Radio observatory founded in 1986 in the science town of Taeduk, Taejon City, Korea. The facility is part of the Korea Astronomy Observatory, and operates a 14-m (46-ft) millimetre-wave telescope enclosed in a radome. The telescope was equipped with new high-performance receivers in 1995. Tarantula Nebula This emission nebula in the Large Magellanic C loud is glowing with the radiation from hot stars buried within it. Its pinkish colour is caused by ionized hydrogen (HII). Taiwan Oscillation Network (TON) Ground-based network to measure solar intensity oscillations to study the internal structure of the Sun. Solar images in the light of the calcium K line are taken at the rate of one per minute with identical telescopes in Tenerife, Huairou (near Beijing), big bear solar observatory and Uzbekistan. The network has been gathering data since 1994, and two extra observing stations are planned in order to improve longitude coverage. tangential velocity (transverse velocity) Velocity of a star measured across the line of sight of the observer. Observations of a star's gradual change in position over a long period of time give a measure of its annual proper motion; if its distance in parsecs is also known, its tangential velocity can then be calculated. Measurements of the Doppler shift in its spectrum provide its radial velocity (velocity along the line of sight) and from the two, the star's true velocity (space velocity) can be computed. Tarantula Nebula (NGC 2070, 30 Doradus) Emission nebula in the large magellanic cloud (RA 05h 39m dec. —69°57'); it is illuminated by an embedded cluster of recently formed hot O and B stars. The Tarantula Nebula, also known as the Loop Nebula, takes its name from 'spidery' extensions of nebulosity on its outer edge. Its apparent angular size of 30' corresponds to a true diameter of about 900 l.y. Tarazed The star y Aquilae, visual mag. 2.72, distance 460 l.y., spectral type K3 II. With Alshain (P Aquilae), mag. 3.71, it forms the 'wings' either side of the 'eagle star', Altair. The names Alshain and Tarazed come from a Persian expression referring to a beam or balance. T association Region of recent and active star formation in which the dominant visible population comprises low-mass, roughly solar, stars. 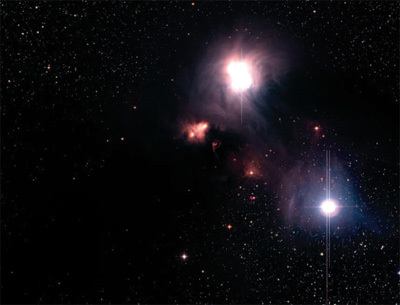 These stars, in their pre-main-sequence phase of life, are styled t tauri stars. They are named after the prototype in the taurus dark clouds complex, which, at a distance of 500 light-years, is one of the nearest stellar nurseries to the Sun. Low-mass stars form throughout the dark clouds of T associations, and embedded clusters can be observed at infrared wavelengths. Occasionally, high-mass young stars are also found in T associations, but only within the darkest, densest cores of clouds. The importance of T associations is that their members afford a series of snapshots of our young Sun through its infancy. If we could order these different stars correctly, we would have constructed an evolutionary sequence for our Sun. It might also be clear how and when the planets formed, and over what period. The T Tauri stars themselves are irregular optical variables. 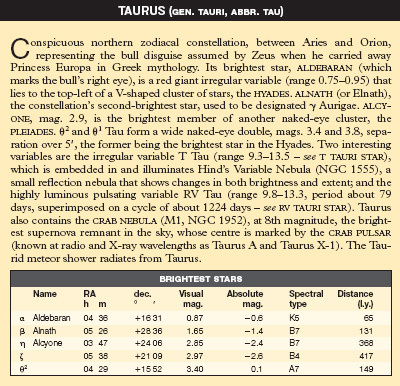 In the nearby Taurus-Auriga T association the stars are of the 11th to 19th visual magnitude. Infrared brightness characterizes T association stars, because they are still surrounded by dusty obscuring circumstellar material, which will eventually be accreted by the central star. Of topical interest is the manner in which the already formed stars of a T association interact with their parent gas clouds. Vigorous winds terminate the protostellar accretion phase of T Tauri stars (perhaps after only a million years) and stir up the ambient medium of the T association through bipolar flows. Such flows are likely to act against the ready formation of new low-mass stars in their immediate vicinities. Taurids meteor shower active between October 15 and November 25, producing low rates even during its broad peak in the opening week of November. At best, observed rates may reach 5 meteors/hr, from radiants near the Hyades and Pleiades. The shower is produced by debris from Comet 2P/encke. Material in the Taurid meteor stream has become very spread out. Taurids are slow (30 km/s or 19 mi/s) and a reasonable proportion are bright. The stream is encountered again during June, when it produces the daytime beta taurids. Taurus dark clouds Large complex of gas and dust clouds in Taurus forming a giant molecular cloud. They are about 500 l.y. away. The clouds are the site of continuing star formation and of many ttauri stars. Taylor column Relatively stagnant column that forms over an obstacle immersed in a rotating fluid. Such columns were first studied in the laboratory by the British physicist Geoffrey Taylor (1886-1975). In the 1960s a Taylor column was suggested as the explanation of Jupiter's great red spot. This theory has since been discounted. Teapot (of Sagittarius) Distinctive shape formed by eight stars in Sagittarius: 7, e and 8 Sagittarii form the spout of the teapot, X Sagittarii is the tip of its lid, while, i, t and Sagittarii outline its handle. Tebbutt, Comet (C/1861 J1) Long-period comet discovered on 1861 May 13 by the Australian astronomer John Tebbutt (1834-1916). The comet reached perihelion 0.82 AU from the Sun on June 12, and became a bright, magnitude 0 object as it moved into northern hemisphere skies. Earth passed through the comet's tail on June 30 at the time of closest approach (0.13 AU), the first recorded instance of such an encounter. The tail reached a maximum extent of about 100°. Comet Tebbutt has an orbital period of 409 years. technetium star Star, generally a giant star on the asymptotic giant branch of the hertzsprung-russell diagram, that shows technetium in its spectra. Technetium is an unstable radioactive element. It does not occur naturally on Earth but was the first element to be created artificially. As it has a half-life of 2.1 X 105 years, shorter than the life of the stars in which it is observed, it must be created in the star. It is believed to be created during shell burning. tectonics Deformation of the lithosphere of a planetary body. On Earth, the dominant mechanism for producing large-scale topographic features is 'plate tectonics'. Large sections of the lithosphere, thousands of kilometres in extent, are shifted by convective motions in the underlying mantle. Differential motions of these 'plates', moving at a few centimetres per year, result in distortions. Plates sliding past each other are bounded by strike-slip faults; these faults are sources of earthquakes. when accumulated stress causes rupture of the lithosphere. Head-on collisions at thrust faults cause compression and uplift, producing mountain ranges, such as the Himalayas at the conjunction of the Indian and Asiatic plates. Stretching of continental plates produces normal faults and linear depressed features (grabens). Oceanic crust is subducted into the mantle at trenches; it is renewed by lava rising at mid-ocean ridges where plates are pulling apart. tectonics On the left is Earth’s San Andreas fault and on the right, the strike-slip fault Astypalaea Linea on Jupiter’s satellite Europa. The icy surface of Europa appears to fracture in blocks as it moves over the underlying ocean. Conspicuous northern zodiacal constellation, between Aries and Orion, representing the bull disguise assumed by zeus when he carried away Princess Europa in Greek mythology. Its brightest star, aldebaran (which marks the bull's right eye), is a red giant irregular variable (range 0.75-0.95) that lies to the top-left of a V-shaped cluster of stars, the hyades. alnath (or Elnath), the constellation's second-brightest star, used to be designated 7 Aurigae. alcyone, mag. 2.9, is the brightest member of another naked-eye cluster, the pleiades. 02 and 01 Tau form a wide naked-eye double, mags. 3.4 and 3.8, separation over 5', the former being the brightest star in the Hyades. Two interesting variables are the irregular variable T Tau (range 9.3-13.5 - see ttauri star), which is embedded in and illuminates Hind's Variable Nebula (NGC 1555), a small reflection nebula that shows changes in both brightness and extent; and the highly luminous pulsating variable RV Tau (range 9.8-13.3, period about 79 days, superimposed on a cycle of about 1224 days - see rv tauri star). Taurus also contains the crab nebula (M1, NGC 1952), at 8th magnitude, the brightest supernova remnant in the sky, whose centre is marked by the crab pulsar (known at radio and X-ray wavelengths as Taurus A and Taurus X-1). The Tau-rid meteor shower radiates from Taurus. Plate tectonics is responsible for continental drift; over Earth's history the continents have been rearranged like pieces of a gigantic puzzle. Other planets have different styles of tectonics. Mercury's numerous scarps or ridges appear to be the result of compression; they apparently were produced by global shrinkage of the planet as its core cooled and solidified. Venus' large circular features (coro-nae) may have been produced by upward or downward motions of magma below the lithosphere. Mars has numerous grabens associated with its large volcanoes; the huge canyon valles marineris may be a rift valley. although there is little evidence for plate tectonics. Jupiter's satellites Europa and Ganymede show evidence of motions of sections of their icy crusts. tektite Object of natural glass found scattered across four main areas, known as strewnfields, of the Earth's Small, inconspicuous southern constellation, representing a telescope, between Ara and Indus. It was introduced by Lacaille in the 18th century. Its brightest star, a Tel, is mag. 3.5. RR Tel is a NOVA-LIKE VARIABLE, and the only such star to have been recognized as variable before it began its slow (1600-day), unprecedented rise to 7th magnitude in 1944.
terminator Because features near the day-night boundary on the Moon are lit obliquely, more details can be observed than at other times. This Galileo orbiter image of the Moon reveals central peaks within craters close to the terminator, while little structure is seen in other areas surface. The Australasian strewnfield stretches from Tasmania, across Australia to Sumatra and the Philippines and to the Southeast Asian mainland. Australian tektites, known as australites, are 830,000 years old, compared with 690,000 years old for the remainder of the strewnfield, thus two groups may be represented. The parent crater for this strewnfield is unknown. The Ivory Coast tektites are 1.3 million years old. They are related to the impact crater of similar age at Lake Bosumtwi, Ghana. Moldavites are tektites found in the Czech Republic. Their age, of 14.7 million years, links them with the Ries impact structure in south Germany. The North American tektites, found in Texas and Georgia (and one only from Martha's Vineyard, Massachusetts), are 34 million years old. They are now linked to the Chesapeake Bay impact structure. Micrometeorites related to the Australasian, Ivory Coast and North American tektites occur in marine sediments. terminator Because features near the day–night boundary on the Moon are lit obliquely, more details can be observed than at other times. This Galileo orbiter image of the Moon reveals central peaks within craters close to the terminator, while little structure is seen in other areas. Tektites are unrelated to volcanism. Their usual shapes, such as teardrop, disc or dumbbell, suggest that they were once fluid, but they may be corroded. The Southeast Asian tektites are the largest, with masses of up to 15 kg; the Muong-Nong type have laminar flow structures. Many of the south-east Australian tektites have features indicative of high-velocity atmospheric flight, such as a 'button' shape, atmospheric ablation having melted the front part of an original sphere, causing melt to flow backwards to form a flange. Ivory Coast and Australasian tektites are opaque, unless very thin. Moldavites are green and North American tektites brown. All are silica-rich, containing inclusions of lechatelierite (pure silica glass) and other residual minerals. A lunar origin was suggested for tek-tites, but the return of lunar samples reinforced the terrestrial chemical and isotopic signatures. Tektites are terrestrial material that has been subjected to extraterrestrial impact. Following the impact, molten or vaporized ejected material coagulated and re-entered the atmosphere to land as tektites. tele-compressor Converging lens inserted into the light path of a telescope to reduce the focal length; it produces a wider field of view and a faster focal ratio for photographic purposes. tele-extender Extension tube containing an optical device and used in conjunction with an EYEPIECE to increase the effective focal length of a telescope. telescope Device that augments the ability of the eye to observe distant or faint objects, particularly celestial objects. The Egyptians were making glass around 3000 BC, and the Greeks had a good understanding of the refraction and reflection of light by glass lenses in 300 BC, but it was nearly two thousand years before the telescope made its appearance. In 1608 the Dutch spectacle-maker Hans LIPPERSHEY applied for a patent for his 'instrument for seeing at a distance', the first REFRACTING TELESCOPE. While Lippershey is generally acknowledged to be the inventor of the telescope, there were enough competing claims that his patent application was denied. There is also some evidence that devices resembling the telescope were around in the previous century (see DIGGES). It was in May 1609 that Galileo first heard about the telescope while travelling in Venice. He proceeded to build one within 24 hours of returning home. His design, the GALILEAN TELESCOPE, enabled him to observe four moons of Jupiter, mountains and valleys on the Moon, sunspots and the phases of Venus. However, it suffered from severe CHROMATIC ABERRATION and SPHERICAL ABERRATION. Around 1616, Niccolo Zucchi (1586-1670), a professor of mathematics from Rome, proposed a solution to these problems by replacing the objective lens with a mirror, creating the first REFLECTING TELESCOPE, but got poor results from the example he constructed and abandoned the effort. Johannes KEPLER, Rene Descartes (1596-1650), Marin Mersenne (1588-1648), James GREGORY and Robert HOOKE all developed alternative designs, but the technologies of the day were unable to produce workable instruments from their specifications. By the late 1650s, the only solution to the aberrations that plagued the refractors of the day was to increase the FOCAL LENGTH. Chromatic and spherical aberration are both reduced when the focal length is increased, and so the telescopes grew. By 1670 almost unusable ^300 monsters stretching 67 m (220 ft) from objective to eyepiece were being built. telluric absorptions from oxygen (O2), while Fraunhofer a (716.5 nm) is from water. 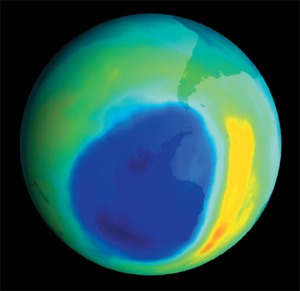 Telluric carbon dioxide and water absorptions block much of the infrared; telluric ozone blocks the ultraviolet. Telluric absorption lines strengthen as the body sets, allowing them to be identified. Telluric lines can in part be avoided by Doppler shifts caused by the relative motion of the Earth and the body being observed. Telluric auroral emission lines also contaminate astronomical spectra. Tempel, (Ernst) Wilhelm (Leberecht) (1821-89) German observational astronomer, a prolific discoverer of comets. He found his first comet (C/1859 G1) from Italy, using a 4-inch (100-mm) Steinheil refractor. Over the next 18 years he discovered twelve more of these objects, five asteroids and several nebulae, including the reflection nebula around Merope in the PLEIADES. Most of Tempel's comet discoveries were made from Marseilles Observatory; he also worked as Giovanni SCHIAPARELLl's assistant at Brera Observatory (Milan) and directed ARCETRI OBSERVATORY (Florence). Tempel-1, Comet 9P/ Short-period comet discovered on 1867 April 3 by Wilhelm Tempel. It is always faint and was lost from 1879 until 1967. The orbit was modified by passages close to Jupiter in 1881, 1941 and 1953. Currently, the perihelion distance is 1.49 AU, and the period is 5.51 years. Tempel-Tuttle, Comet 55P/ Short-period comet discovered on 1865 December 19 by Wilhelm Tempel, Marseilles, France, and independently on 1866 January 5 by Horace Tuttle (1837-1923), Harvard, USA. The comet currently has a period of 33.22 years, and the orbit is retrograde, being inclined to the ecliptic by 162°.5. During its discovery apparition, the comet reached peak magnitude +3, and showed a short tail. Although the orbit was established at this return, Comet 55P/Tempel-Tuttle was not observed again until 1965. At one of its past returns, in 1366, it made the third-closest approach (0.0229 AU) of a comet to Earth in historical times. The most recent return, with perihelion on 1998 February 28, was quite favourable, with the comet reaching peak magnitude + 6.5. Comet 55P/Tempel-Tuttle is the parent of the LEONIDS, which have produced meteor storms close to several of the comet's past returns (most recently in 1966, 1999 and 2001); they show substantially enhanced activity for about five years to either side of perihelion. Tempel-2, Comet 10P/ Short-period comet discovered on 1873 July 3 by Wilhelm Tempel. Its current period is 5.47 years. IRAS observations in 1983 showed 10P/Tempel-2 to have an associated dust trail more than 0.67 AU (100,000,000 km or 62,000,000 mi) long. temperature Property of an object that determines whether heat energy will flow into it or out of it when it is in contact with another object. The direction of flow of heat energy is from the object at the higher temperature to that at the lower. If there is no energy flow then the two objects are in THERMAL EQUILIBRIUM. Temperature is quantified through various physical phenomena. The most generally applicable measure is the EFFECTIVE TEMPERATURE, which is based on the temperature of an equivalent BLACK BODY. Other temperatures include: the RADIATION TEMPERATURE, which is based on the black body emission at a single wavelength; the colour temperature, based upon the COLOUR INDEX; the thermal or kinetic temperature, based upon the thermal motions of the atoms, ions, electrons and so on; the excitation temperature, based upon the levels of EXCITATION of the electrons within an atom or ion; and the ionization temperature, based upon the levels of IONIZATION of an element. The value obtained for the temperature may vary depending on the property upon which it is based. Thus the effective temperature of the solar CORONA is about 100 K, while the kinetic temperature of the electrons within it is about 1,000,000 K.
Tethys Ithaca Chasma can be seen to the right in this image of Saturn's satellite Tethys. Younger craters are superimposed on the giant trough, indicating that it is an ancient feature. temperature scale Graduated scale of degrees for measuring TEMPERATURE. The principal temperature scales are the ABSOLUTE (or Kelvin) scale and the CELSIUS (or Centigrade) scale. The unit of temperature on the absolute scale, the kelvin (K), is equal in magnitude to one degree on the Celsius scale (°C). The zero points of the two scales differ however, with 0°C equal to 273.15 K. To convert from one scale to the other, 273.15 has to be added to the temperature on the Celsius scale or subtracted from the temperature on the absolute scale. All physical formulae require the temperature to be expressed on the absolute scale. Tempe Terra Region of mars east of acidalia planitia (40°.0N 71°.0W). It is associated with the long 'ditch' Tempe Fossa. terminator Boundary between the illuminated and non-illuminated hemispheres of a planet or satellite; in other words, the dividing line between day and night. From the Earth, the terminator is only visible on those bodies that exhibit PHASES, that is Mercury, Venus, Mars and the Moon. Because of its relative proximity, it is possible to see that the mountainous surface of the Moon causes its terminator to appear jagged and irregular, rather than as a smooth line. terracing Formation of terraces - relatively flat, horizontal or gently inclined surfaces, bounded by a steeper ascending slope on one side and by a steeper descending slope on the opposite side. Terracing is typical on the inward-looking slopes of large impact CRATERS. terrestrial planet Term used to describe the inner, rocky planets of the Solar System (Mercury, Venus, Earth and Mars), which have similar characteristics in terms of size and density. These contrast with the largely gaseous giant or JOVIAN planets. (Pluto, having more in common with cometary planetesimals, is not generally included in this group.) The differences between the terrestrial and Jovian planets are thought to have been caused by their respective distances from the Sun during the early formation of the Solar System. Tethys Fifth-largest SATELLITE of SATURN. It was discovered by G.D. CASSINI in 1684, the year in which he also discovered its outer neighbour, DIONE. Tethys shares its orbit with the tiny irregular satellites TELESTO and CALYPSO, which travel in stable LAGRANGIAN POINTS 60° ahead of it and 60° behind it, respectively. 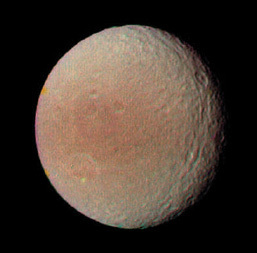 Tethys is similar in size to Dione and is heavily cratered. In one region the plains between large ancient craters have been flooded by cryovolcanism up to the crater rims. This happened a long time ago, because there has been time for many younger (and smaller) craters to have formed on the plains. Tethys is remarkable in having one enormous crater, named odysseus, the diameter (440 km/270 mi) of which is 40% of the diameter of the satellite itself. The impact that created this crater was almost violent enough to break Tethys into fragments. Tethys Ithaca Chasma can be seen to the right in this image of Saturn’s satellite Tethys. Younger craters are superimposed on the giant trough, indicating that it is an ancient feature. Thalassa Small inner satellite of neptune, discovered in 1989 by the voyager 2 imaging team. Thalassa is about 80 km (50 mi) in size. It takes 0.312 days to circuit the planet, at a distance of 50,100 km (31,100 mi) from its centre, in a near-circular, near-equatorial orbit. Thales of Miletus (c.625-c.547 bc) Greek polymath, born in what is now modern Turkey, famous for his teaching that everything in the Universe sprang from a primordial mass of water. According to Herodotus (c.484-425 bc), Thales predicted the total eclipse of the Sun that occurred in 585 bc, though this may be apocryphal. Thales travelled to Egypt and Babylon, bringing back to Greece the astronomical knowledge of those civilizations. He defined the constellation Ursa Minor, which, because of its inclusion of the North Pole Star, he used for navigational purposes. Tharsis Montes (Tharsis Ridge) Main volcanic region of mars. Tharsis is a complex area with two rises. In the northern part stands the volcano alba patera. On the main Tharsis Ridge, in the southern half of Tharsis, stand three aligned volcanoes, arsia mons, pavonis mons and ascraeus mons, each separated from the next by about 700 km (430 mi). The Astronomer (TA) Monthly UK publication providing rapid dissemination of raw reports from observers around the world, established as The Casual Astronomer in 1964. TA also performs a relatively informal co-ordinating role for various patrols, notably for novae and super-novae, alongside the british astronomical association. Thebe One of the inner moons of jupiter, discovered in 1979-80 by Stephen Synnott in images obtained by the voyager project. Thebe is irregular in shape, measuring about 110 x 90 km (70 x 60 mi). It orbits Jupiter at an average distance of 221,900 km (137,900 mi), giving it a period of 0.675 days. Its orbit is of low eccentricity (0.018) and is inclined to the Jovian equator by only 1°.1. Theophilus Lunar crater (12°S 26°E), 101 km (63 mi) in diameter. It is a complex crater, with terraced side-walls and central peaks. Theophilus is just old enough for most of the bright rays to have been eroded away, though a few are still visible. Its continuous and discontinuous ejecta are easily observed at low Sun angles. Theophilius overlies part of the older crater cyrillus. thermal equilibrium State in which all parts of a system have the same temperature and there is no flow of heat energy from one part of the system to another or to or from the surroundings. thermal radiation radiation that arises as a consequence of the thermal energy in a body. For astronomical sources it is usually either black body radiation or free-free radiation. Non-thermal radiation sources include synchrotron radiation and maser emission. If these latter sources are mistakenly interpreted as thermal radiation, then the inferred temperature may be many orders of magnitude too high. thermosphere Outermost layer of the Earth's atmosphere. It lies above the mesopause, at a height of 86-100 km (53-62 mi), which is the upper boundary of the mesosphere. Within the thermosphere, the temperature rises with height as the Sun's far-ultraviolet and X-ray radiation is absorbed by the oxygen and nitrogen of the thin air. This process produces ionized atoms and molecules and is responsible for the formation of the layers in the ionosphere, at altitudes of between 60 and 500 km (40 and 310 mi). aurorae and meteors also occur in the thermosphere. The temperature climbs to about 780 K at 150 km (90 mi) and 1600 K at 500 km (310 mi). However, the atmospheric density is extremely low, decreasing from seven-millionths of its sea-level value at the mesopause to only about one-million-millionth (10~12) at 500 km (310 mi) altitude. This density varies with solar activity, increasing when the Sun is active, when the additional heating of the uppermost layers causes the atmosphere to expand. The region above 500 km (310 mi) is often known as the exosphere. Third Cambridge Catalogue (3C) Third in a series of four catalogues of radio sources compiled from surveys carried out from the Cavendish Laboratory, Cambridge, during the 1950s and 1960s by a team that included Antony hewish, Martin ryle and Francis graham-smith. The Third Cambridge Catalogue Survey was completed in 1959, using collectors of greater area and higher sensitivity than its two predecessors; it became the definitive listing of radio sources. Sources in this catalogue are still known by their '3C' designations, for example 3C 273, the first object to be identified as a quasar. third contact During a solar eclipse, the moment when the Moon's trailing (westerly) limb appears to touch the Sun's more westerly limb. In a total eclipse, this marks the end of totality and is usually quickly followed by the appearance of the diamond ring effect and baily's beads, as the Sun's westerly edge is once more revealed. At a lunar eclipse, third contact is the time when the Moon's leading, easterly limb arrives at the eastern edge of Earth's umbra, re-emerging into sunlight at totality's end. three-body problem Fundamental problem in celestial mechanics, to determine the motions of three bodies under the influence of their mutual gravitational attractions. There is no exact general solution, only solutions for some special cases, such as the lagrangian points. It is the formulation that is used as the basis for most theoretical and perturbational studies in celestial mechanics. There has been a vast amount of work to investigate the types of motion that occur close to a commensurability, and all of this takes the three-body problem as the basis, usually with various simplifications in order to isolate the crux of the problem. For example, when analysing the motion of an asteroid close to a commensurability with Jupiter, one might use the plane circular restricted three-body problem. This considers Jupiter to be in a circular orbit, unperturbed by other planets, and the asteroid to be of zero mass and to move in the plane of Jupiter's orbit. The task of determining analytically the PERTURBATIONS of the orbit of a planet or satellite caused by other bodies is invariably reduced to a series of three-body problems. For example, what is referred to as 'the main problem' of lunar theory is to determine the orbit of the Moon around the Earth perturbed by the Sun, with all three bodies regarded as point masses. Perturbations by other planets, and effects of the oblateness of the Earth and the Moon are added later. Even so, it is a substantial problem. The lunar theory constructed by Ernest BROWN occupied him for most of his life; it contains about 1020 periodic terms from the main problem, with a further 580 terms from planetary perturbations. See also MANY-BODY PROBLEM 3C Abbreviation of third Cambridge catalogue 3C 273 (1226+023) First-identified and optically brightest quasar, at z = 0.158 in the direction of Virgo. The optical object was originally identified by timing the disappearance of the radio emission during a lunar occultation, as observed with the Parkes radio telescope. This object has by far the brightest optical and X-ray jet among quasars. 3 kiloparsec arm Spiral arm lying about 3.5 kpc from the centre of our GALAXY; it is visible as 21 cm neutral hydrogen radio emission (see TWENTY-ONE CENTIMETRE LINE). The emission lies within about 20° longitude from the galactic centre; it is expanding outwards at about 50 km/s (30 mi/s). Thuban The star a Draconis, visual mag. 3.67, distance 309 l.y., spectral type A0 III. It was the North Pole Star around 2800 BC. The name is from the Arabic thu'ban. meaning 'serpent'. tidal bulge Deformation of a celestial body in orbit around another as a result of the higher gravitational attraction on the nearside and lower attraction on the farside of the body, compared with the attraction at the centre of the body. The resulting distortion lies along the line joining the two bodies, with bulges both towards and away from the attracting body (see diagram at TIDES). The effect on a fluid ocean is easily understood, but even solid bodies are not completely rigid and will deform because of tidal forces. 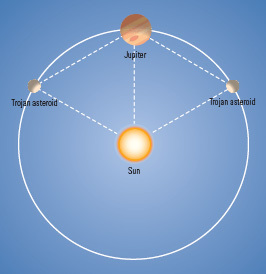 The Sun raises tidal bulges on the planets, and planets raise tidal bulges on the satellites orbiting them. Satellites also raise tidal bulges on their planets. In the case of the Earth and Moon, the tides raised on the Earth are large, because the Moon is a fairly large fraction (1/81) of the mass of the Earth. However even a tiny satellite such as Phobos raises tides on its planet, Mars. These tides are small, and have no significant effect on Mars, but the attraction of this bulge acting back on Phobos causes very significant TIDAL EVOLUTION of the orbit of Phobos. tidal evolution Mechanism that can cause changes to the spin rates of planets and satellites, and to the orbital radii of satellites. The rates of change are very slow, but the accumulated effect can be very significant over the age of the Solar System. The attraction of one body on another raises a TIDAL BULGE on that body. TIDAL FRICTION causes a slight delay in the rise and fall of the bulge, with the result that it does not quite lie along the line between the two bodies: it will either lead or lag, depending on whether the attracting body is orbiting faster or slower than the body is rotating. Thus the gravitational attraction between a satellite and its planet is asymmetrical, with the force having a component at right angles to the line between the bodies; this force exerts a torque. In the case of a satellite orbiting slower than the planet is rotating (that is, it is above the SYNCHRONOUS ORBIT), the nearer bulge exerts a larger torque than the farther bulge, and so there is a net torque acting in the direction of motion of the satellite, and an equal and opposite torque acting on the rotation of the planet. This causes the satellite to spiral outwards, and slows the rotation of the planet. A satellite below the synchronous orbit would spiral inwards, and the planet would rotate faster. Tidal evolution has had many effects on the Solar System. Tides raised by the Sun on planets can despin the planets; this is a probable explanation for the present slow rotation rates of Mercury and Venus. Tides raised by satellites on planets have had numerous effects: causing the Moon to recede and the Earth's rotation to slow down; causing Phobos to spiral into Mars; and causing satellites of Jupiter and Saturn to spiral outwards and become trapped in COMMENSURABILITIES. 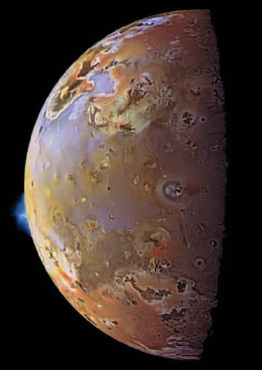 Tides raised by planets on satellites have resulted in most satellites being in SYNCHRONOUS ROTATION with their planet; they have caused intense heating within some satellites, notably IO. tidal friction Dissipation of a small fraction of the energy contained in a TIDAL BULGE as it rises and falls. In the case of the Earth the main dissipation of tidal energy arises from friction at the bottom of shallow seas as the tides sweep through. In bodies without oceans the dissipation mechanisms are not so obvious, and estimates of the rate of dissipation are very uncertain. In a few cases the dissipation of tidal energy within a body can cause significant heating of the body, such as for Jupiter's satellite IO. More often the most significant effect of the tidal friction is to cause a slight delay in the rise and fall of the tidal bulge, with the result that it does not quite lie along the line between the two bodies. This slight asymmetry causes a torque between the two bodies, which can cause TIDAL EVOLUTION. tidal heating Heat produced by the tidal force exerted on a satellite by its primary; this force can distort the satellite. The tidal force varies with distance, and if the satellite's orbit is eccentric the satellite will change shape slightly during each revolution. The work done by this flexing is dissipated as heat; the energy is derived from its orbital energy. Tidal heating drives volcanism on Jupiter's satellite io. It probably maintains a liquid layer beneath the icy crust of europa. tidal heating Jupiter’s satellite Io is the best example in the Solar System of the effects of tidal heating. Without the effects of Jupiter’s gravity Io would be a dead world. Instead it is dotted with active volcanoes through which it releases energy. tides Distortions induced in a celestial body by the gravitational attraction of one or more others. The force a body experiences is greatest on the side nearest the attracting body, and least on the side farthest away, causing it to elongate slightly towards and away from the attracting body, acquiring a tidal bulge on each side. tides The gravitational effects of the Sun and Moon combine to distort the oceans on Earth. When the Sun and Moon are lying in the same direction, high tides are at their highest and the difference between high and low tides is at its greatest magnitude. When the Sun and Moon are pulling in different directions, neap tides result – high tides are not particularly high, and the difference between high and low tide is less. On the Earth tides are raised by the Moon and by the Sun, the effect of the Moon being about three times that of the Sun. 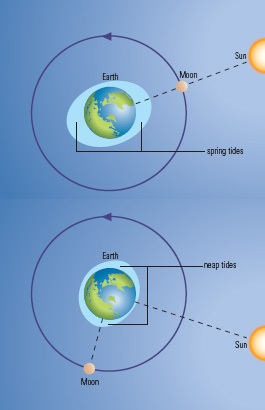 As the Earth rotates, different parts of the surface move into the tidal bulge region, causing two high tides and two low tides in just over a day. The tides most obviously affect the fluid ocean, but even the solid crust, which is supported by a fluid mantle, is able to flex, experiencing tides of up to 25-cm (c.10-in.) amplitude. When the Sun and the Moon are exerting a pull in the same direction (as at new moon or full moon) their effects are additive and the high tides are higher (spring tides). When the pull of the Sun is at right angles to that of the Moon (as at first or last quarter) the high tides are lower (neap tides). tidal friction caused by the tidal ebb and flow of water over the ocean floor causes a slight delay in the response of the oceans to the tidal attracting forces, with the result that the tidal bulge does not lie precisely along the line to the attracting body. This asymmetry causes a torque between the Earth and the Moon (see also tidal evolution), which transfers angular momentum and energy from the Earth's rotation to the orbit of the Moon. This results in a slowing of the Earth's rotation and thus an increase in the length of the day (see also leap second), and in the secular acceleration of the Moon, causing it to recede from the Earth at about 3.8 cm/yr (1.5 in./yr). A similar mechanism is probably responsible for evolution of the orbits of many of the natural satellites of the Solar System. The tidal forces between the Earth and the Moon also cause a tidal bulge on the Moon. A similar effect of the transfer of angular momentum from the Moon's rotation to its orbit has resulted in the present state of synchronous rotation, with the same face of the Moon always towards the Earth. Similarly most of the satellites of the major planets are in synchronous rotation with their primary. For the Jovian satellite io the tidal effect is very large, due to its relative closeness and the large mass of Jupiter. Also Io has a fairly large orbital eccentricity (0.0043), and this causes the tidal bulge on Io to rise and fall and oscillate around a mean position as the distance and direction of Jupiter vary in each orbital revolution. There is a dynamical process that would normally react on the orbit and reduce the eccentricity to eliminate this effect, but it cannot operate for Io, as its eccentricity is actually caused by its 2:1 commensurability with Europa. The result is that the continued dissipation of tidal energy has caused internal heating and is responsible for the violent volcanic activity on Io. The culmination of TCT designs is the Stevick-Paul. Invented in 1993 by amateur David Stevick (1944- ) and based on the design for a corrector assembly by French optician Maurice Paul from 1935, the Stevick-Paul has a tilted focal plane but negligible other distortions and can be built to reasonably fast (low) focal ratios. time Property of the Universe determined by the observed order of events and in which effects follow causes. Newtonian or classical physics allowed the existence of an absolute time framework, whereby different observers could agree on the time of occurrence of an event by making an allowance for the travel times of light over different distances. Such an absolute time framework permitted the simultaneous occurrence of events taking place at different points in space. The concept of simultaneity breaks down under relativistic physics. With relativity, different observers measure time elapsing at different rates depending on their relative velocities, accelerations and strengths of their local gravitational fields (or spacetime distortions). Nonetheless, even under relativity events always follow causes, and a sequence of events occurring at a single point in space is seen by all observers to occur in the same order. Only if information could be passed from observer to observer faster than the speed of light in a vacuum, could this causality basis of time be upset, thus allowing travel backwards in time. where x, y and z are the spatial coordinates, t is the time, and c the velocity of light in a vacuum. Newtonian gravitational forces are then replaced by particles following geodesic tracks through a spacetime that has been distorted from Euclidean geometry by the presence of masses. The measurement of time is the subject of ordinary observation and experience and is based upon sequences of events occurring at regular intervals. Annual and diurnal changes led in pre-history to the concept of the year and the day. Less clearly, lunar cycles may have led to the month. The development of clocks of increasing accuracy and reliability began with the sundial and nocturne, and proceeded through the development of the water clock, pendulum, balance wheel, quartz crystal to the atomic clock of today. The current unit of time is the second, which has been defined since 1967 as 'the duration of 9,192,631,770 periods of the radiation corresponding to the transition between the two hyperfine levels of the fundamental state of the atom caesium 133'. Within the limits of measurement, this definition was identical to the one in use previously, which was based upon the Earth's orbital motion. This 'ephemeris second' was defined as 1/31,556,925.9747 of the tropical year for 1900 January 0d 12h. international atomic time (TAI) is now used as the starting point for all other types of time scale. 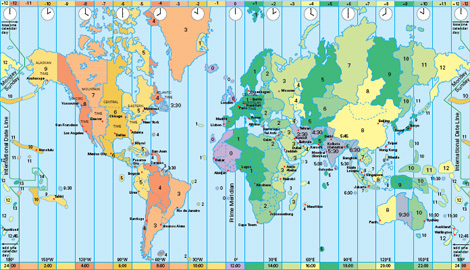 The time scale used for civil purposes is universal time (UT), otherwise known as greenwich mean time (GMT). It is defined as the hour angle of the mean sun plus 12 hours (so that the start of the civil day is midnight, not midday). UT is based upon the Earth's rotation, not its orbital motion, and it is therefore affected by changes in the rotation of the Earth. The UT corrected for the chandler wobble is called UT1, and is the basis of civil timekeeping. It is kept to within 0.9 seconds of TAI by the occasional insertion or removal of a leap second. The difference between the time given by a sundial (solar time) and UT is called the equation of time. The solar day is 86,400 atomic seconds long. The Earth's actual rotation period is given by the sidereal day, and this is 86,164.1 atomic seconds (23h 56m 4s.1) long. See also calendar; julian date; time zones. time dilation effect Effect whereby a clock on a moving object runs slower than a similar clock stationary with respect to the observer (see special relativity). timekeeping Our concept of the passage of time is based on the regular rising and setting of the Sun each day, in other words the rotation of the Earth, which provides a ready-made framework by which to regulate events in our lives. The Earth, however, is not a good timekeeper; its rotation rate is irregular and slowing because of the effects of tidal braking. This did not become apparent, however, until the early 20th century, when the free pendulum clock was developed, which was accurate to within a second a year. Subsequent quartz crystal-controlled clocks and atomic clocks confirmed the small, but significant, variations in the Earth's rate of rotation. The first crude methods of accounting for the passage of time involved measuring the length of the shadow cast by a stick placed upright in the ground. Early mechanical clocks appeared during the 15th and 16th centuries and it was then that the system of splitting the day up into hours of equal length came into regular use. The invention of the pendulum clock in the 17th century provided a more accurate means of timekeeping. During the 18th century clocks were perfected that were accurate enough to be used at sea to help determine longitude and also for scientific purposes. But even with these man-made methods of accounting for time, the basic way of measuring its passing was still the rotation of the Earth, and clocks were adjusted accordingly to keep in step with it. Until 1955 the scientific standard of time, the second, was based on the Earth's period of rotation and was defined as 1/86,400 of the mean solar day. The current standard, the SI second, was defined in 1967 as being the duration of 9,192,631,770 periods of the radiation corresponding to the transition between two hyperfine levels of the ground state of the caesium-133 atom (see atomic time). The internationally adopted timescale international atomic time (TAI) is formed by inter-comparing the results from many different atomic clocks around the world. In the UK, atomic clocks at the National Physical Laboratory (NPL) at Teddington keep the country's time accurate to within one second in three million years. These clocks are used to disseminate time in a variety of ways, including via the MSF time signal, which is broadcast from the Rugby Radio Station, and the familiar 'six pips'. For civil time-keeping purposes a uniform timescale is used; it is formed by atomic clocks, but kept in step with the rotation of the Earth through the periodic introduction of leap seconds. For convenience, we also advance our clocks in summer by one hour in order to make better use of the increased daylight hours. Our need for, and use of, accurate time is expanding. For everyday life, today's watches and clocks are sufficient, but for other applications, more accurate methods are needed. Telecommunications systems rely on being able to measure precisely small intervals of time in order to ensure that data transmitted down telephone lines is sent at the correct rate. This has become ever more imperative with the all-pervasive Internet and the increasing use of electronic means of communication such as e-mails. Navigation systems, used aboard shipping and aircraft (and even becoming widely available for road vehicles), use the Global Positioning System (GPS) of satellites which have atomic clocks on board. These satellites broadcast timing signals that enable ground positions to be established to within a few tens of metres. timescale Specified system of measuring the passage of time based on a given frame of reference. There are two kinds of timescale: those based on the rotational or orbital period of the Earth, and those that measure continuous units of time defined by atomic processes. The best-known timescale in the world is greenwich mean time (GMT), which is based on the mean solar time at the Greenwich meridian; it is officially now known as universal time (UT). UT is a non-uniform timescale, derived by accurately and continually measuring the rotation of the Earth. Raw data from these measurements are used to produce a timescale called UT0, which is then corrected for the shift in longitude caused by the slight wandering of the Earth's geographical poles (see polar motion). This corrected timescale is designated UT1. Since the rotation of the Earth is non-uniform, being subjected to tidal braking, any timescale based on this rotation will also be non-uniform. For scientific purposes, therefore, a continuous, uniform timescale is required and this is provided by international atomic time (TAI), which is based on the SI second (see atomic time). TAI has run continuously since 0h 0m 0s GMT on 1958 January 1, and it is used as a standard against which other clocks can be measured. In calculations of the predicted positions of celestial bodies, which involve gravitational equations of motion, a timescale called DYNAMICAL TIME, which is also based on the SI second, is used. In 1984 this replaced EPHEMERIS TIME, which was previously used for such calculations and was based on the Earth's orbital motion around the Sun. For practical, everyday use we require a civil timescale that is both accurate and uniform but that is also linked to the rotation of the Earth. COORDINATED UNIVERSAL TIME (UTC) fulfils this purpose, being derived from atomic clocks but kept in step with the rotation of the Earth through the periodic introduction of LEAP SECONDS. Because of this, TAI and UTC run at the same uniform rate but differ by an integral number of seconds. The International Bureau of Weights and Measures (BIPM) in Paris co-ordinates international timescales. In the United Kingdom, responsibility for providing a national time service lies with the National Physical Laboratory (NPL) at Teddington. time zone Geographical division of the Earth's surface, 15° of longitude wide, where civil time is deemed to be the same throughout. The globe is divided into 24 such history determines its colour and other properties. At Yale University (1975-1981) she extended this research, comparing UBV colours of 'normal' galaxies with those of 'peculiar' galaxies disturbed by collisions, concluding that 'normal' spirals have lower star-formation rates and older average stellar ages. Titan By far the largest SATELLITE of SATURN; it was found in 1655 by Christiaan HUYGENS. Titan was the first planetary satellite to be discovered since Jupiter's GALILEAN SATELLITES in 1610. It is also the only satellite to have a substantial atmosphere, which was discovered in 1944 by Gerard KUIPER. Titan The Hubble Space Telescope observed Titan in the near-infrared in order to penetrate the atmospheric haze. Titan always keeps one hemisphere facing its parent planet, Saturn, much as the same side of the Moon always faces Earth. Titan is the first outer planet satellite to have been targeted by a landing probe: the HUYGENS lander is due to detach from the CASSINI Saturn orbiter for a parachute descent to Titan's surface in 2004 November. Cassini will map Titan's surface by imaging radar. Huygens carries optical imagers for use during descent as well as a variety of analytical experiments to examine the nature of the atmosphere and surface. VOYAGER images of Titan obtained in 1980 and 1981 merely showed an opaque orange atmosphere overlain by a blue haze layer. The HUBBLE SPACE TELESCOPE, however, has been able to see through the atmosphere to reveal an apparently stable pattern of ALBEDO markings. Titan has a similar density to Jupiter's largest satellite, GANYMEDE, and is almost as big. Indeed, some old tables add the 200 km (120 mi) thickness of the opaque part of Titan's atmosphere to its radius, thereby counting Titan as the largest planetary satellite of all. Titan's density of 1.88 g/cm3 argues for it being largely an icy body, but it is not known to what extent it has become internally differentiated (see DIFFERENTIATION) to form a rocky or iron-rich core. Most of Titan's nitrogen- and methane-rich atmosphere is probably inherited from gases scavenged directly from the SOLAR NEBULA and the circum-Saturn gas and dust cloud within which Titan grew. However, it is likely to have been augmented by subsequent degassing from Titan's interior. The reason why the young Titan was able to scavenge and retain an atmosphere, whereas Ganymede and CALLISTO could not, is that Titan grew in a colder environment, being farther from the Sun and zones, each one an hour different from its neighbours. The zone centred on the local MERIDIAN at the GREENWICH OBSERVATORY, and where GREENWICH MEAN TIME or UNIVERSAL TIME is kept, was adopted in 1884 as the reference point from which all other zones should be measured. Those east of Greenwich are ahead by an integral number of hours whilst those to the west are behind. At the 180° longitude line, the transition between the two is marked by the INTERNATIONAL DATE LINE. Tinsley, Beatrice Muriel Hill (1941-81) New Zealand astrophysicist who revolutionized the study of the extra-galactic distance scale by taking the evolutionary stage of galaxies into account when measuring distances to clusters of galaxies. Her PhD thesis at the University of Texas incorporated models of star formation and evolution, nucleosynthesis of the heavier elements, and the interstellar medium, opening up a new field of astrophysical cosmology. Tinsley showed that a galaxy's star formation receiving less warmth from its planet. Saturn's other satellites are much smaller, so their gravity is insufficient for them to have clung on to any gas. Titan's atmosphere shields its surface from radiation, so water-ice does not get broken down or liberated as a vapour, and the surface temperature of 90 K is far too cold for ice to evaporate naturally. Titan's atmosphere is. therefore, both dry and free of oxygen. As a result, it contains compounds now extremely rare in the atmospheres of the terrestrial planets, but which may have been abundant there originally. Compounds detected spectro-scopically include hydrocarbons, such as ethane (C2H6), ethene (C2H4), ethyne (C2H2) and propane (C3H8), and nitrogen compounds, such as hydrogen cyanide (HCN), cyanogen (C2N2) and cyanoacetylene (HC3N). Many of these gases condense in Titan's atmosphere, contributing to the smog that obscures the surface. The atmosphere's orange colour is probably caused by these simple hydrocarbon molecules linking into longer chains by means of reactions triggered by solar ultraviolet radiation. Ethane could play a fascinating role in Titan's meteorology, because condensed droplets of ethane should fall to the surface and collect there as liquid. If so, Titan's cold and dark nature is made even more miserable by a continual ethane drizzle. Winds blow at 100 m/s (330 ft/s) in Titan's upper atmosphere, but there is currently no knowledge of the near-surface wind pattern. Titov, Gherman Stepanovich (1935-) Soviet cosmonaut who piloted the Vostok 2 spacecraft in 1961 August, so becoming the second man to orbit the Earth (and the first to suffer from 'space sickness'). He completed 17 orbits in a flight lasting more than 24 hours. Tombaugh, Clyde William (1906-97) American astronomer who discovered Pluto in 1930. Tombaugh was hired by lowell observatory in 1929 to photograph the sky with the 330-mm (13-in.) astrographic telescope and to scan the photographs with a blink comparator to search for a trans-Neptunian planet. On 1930 February 18, he found a 17th-magnitude object near the star 8 Geminorum that appeared to have moved when two photographic plates taken six nights apart were compared; Percival lowell announced the discovery of Pluto on 1930 March 13. Tombaugh continued his photographic survey for another 15 years, examining millions of star images over 65% of the sky, discovering a comet, numerous asteroids, a nova (TV Corvi) and several star clusters. After World War II, he designed and built telescopic cameras for tracking rockets launched from White Sands, New Mexico. Titan IV Major US military satellite launcher. It began life as the Titan II Intercontinental Ballistic Missile, which still provides the core stage of the vehicle. The Titan IV is the latest and final upgrade of the Titan launch family. It comprises a Titan II core stage with new upper stages and two powerful strap-on solid rocket boosters. It is based on the design of the Titan 3C. The Titan IV first flew in 1989 and is available in six models of Titan IVA and IVB, without an upper stage or with IUS (Inertial Upper Stage) or Centaur upper stages. They are capable of placing 22 tonnes into low Earth orbit and up to 5.8 tonnes directly into geostationary orbit. The vehicle carries military optical and radar reconnaissance, missile early warning and communications satellites. By the end of 2001 Titan IV had made 26 successful and five failed launches. It will be retired from service in about 2003-2004, to be replaced by the heavier version of the delta IV. Titan IV As well as carrying satellites into space, the Titan IV has the ability to boost probes into space. On 1997 October 15, this Titan IVB/Centaur launched the Cassini Huygens probe on its journey towards Titan. Titania Largest satellite of uranus. It was discovered in 1787 by William herschel, who found its neighbour oberon in the same year. The best voyager image of Titania is only good enough to show details down to about 7 km (4 mi) across. This indicates a surface that is more heavily cratered than ariel but less cratered than umbriel or Oberon. It is traversed by fault scarps, 2-5 km (1-3 mi) high and up to 1500 km (900 mi) long. topocentric Pertaining to observations made, or coordinates measured, from a point on the surface of the Earth. This is in contrast to geocentric coordinates or observations, which are measured relative to the centre of the Earth. T Orionis variable Irregular eruptive variable that exhibits Algol-like fades. Like other Orion variables, such stars are found associated with bright or dark diffuse nebulae. Torun Radio Astronomy Observatory (TRAO) Part of the Torun Centre for Astronomy, an educational and research facility of the Nicolaus Copernicus University, Torun, Poland. The main instrument is a modern 32-m (105-ft) radio telescope at Piwnice, 15 km (9 mi) north of Torun. It is used extensively for very long baseline interferometry (VLBI), pulsar timing and spectroscopy. TRAO has been a member of the european vlbi network since 1998.
total eclipse solar eclipse in which the Moon completely covers the bright disk of the Sun; also a lunar eclipse during which the Moon becomes completely immersed in the umbra of Earth's shadow. totality During a total solar eclipse, the interval between second contact and third contact, when the Moon completely obscures the Sun's bright disk; totality at such an eclipse can last up to a maximum of 7 minutes 31 seconds. At a total lunar eclipse, totality is the interval between second and third contacts, when the Moon is completely immersed in Earth's dark umbra, lasting up to a maximum of 1 hour 47 minutes. Total Ozone Mapping Spectrometer (TOMS) Satellite dedicated to mapping global atmospheric ozone levels, the key to understanding ozone depletion. It was launched in 1996 July. The spacecraft complements other craft and instruments on board meteorological satellites, keeping a close watch on the status of the hole in the ozone layer. Total Ozone Mapping Spectrometer In 2000 September, TOMS observed an enormous ‘hole’ in the ozone layer over the Antarctic (blue). In effect, it covered the whole continent (the outline of the Antarctic Peninsula can be seen towards the top right of the hole) and reached as far north as Tierra del Fuego. train Brief 'afterglow', resulting from ionization in the upper atmosphere, that lingers after the extinction of a meteor. In most cases, the train - if present at all - lasts only a matter of a few seconds: those of less than a second's duration are described as wakes. Trains are most commonly seen associated with bright meteors, and with meteors from cometary streams that impact on the upper atmosphere at high velocities: the perseids, orionids and leonids are each noted for their large proportion of train-producing events. Longer-duration trains may drift and undergo distortion in high-atmosphere winds, blowing at up to 400 km/hr (250 mph). Tranquillitatis, Mare (Sea of Tranquillity) Lunar lava plain, roughly 470 km (290 mi) in diameter, located in the central and eastern region of the Moon. This mare is irregular in shape. The dark coloration is the result of flooding with lunar basalts. Other volcanic products include mare ridges and domes (small shield volcanoes). Arcuate rilles occur near the southern and eastern edges. A nearly circular mare ridge system, named Lamont, marks a buried crater. transfer orbit Path followed by a satellite or spacecraft in moving from one orbit to another, for example from low Earth orbit to a higher one, or from the Earth to another planet. transit (2) Passage of a celestial body, particularly one of the inferior planets, directly between the Sun and the Earth, crossing the Sun's disk. Since their orbits are slightly inclined to the ecliptic, mercury and venus usually pass north or south of the Sun at inferior conjunction. If conjunction occurs when the orbit of the inferior planet crosses the ecliptic ( see node), then it is observed from Earth as a small, dark spot moving from east to west across the Sun's disk. This is known as a transit. There are four phases during a transit: two at the start (ingress) and two at the finish (egress). (i) First exterior contact occurs when the planet first appears to touch the Sun's edge or limb; (ii) first internal contact is the point at which the planet is fully upon the Sun's disk but still contiguous with its limb; (iii) second internal contact occurs when the planet touches the opposite limb of the Sun, having crossed its disk; and (iv) second external contact, the moment when the planet's trailing limb finally clears the Sun's disk. In the past, transit observations were used as a method of determining the astronomical unit. Transits of Mercury can only occur during May and November, the former being when the planet is near aphelion and the latter when it is close to perihelion. November events are twice as numerous as those in May but last for a shorter time; neither is visible to the naked eye. The interval between successive events varies from three to 13 years, with the next due in 2003 and 2006, and again in 2016 and 2019. Transits of Venus are very rare but occur in pairs, eight years apart, during June or December. The next events are due in 2004 and 2012, but then not again until 2117 and 2125. Unlike those of Mercury, transits of Venus are visible to the naked eye (although under no circumstances should an observer look directly at the Sun without using an approved, safe filter). transit (3) Passage of a planetary satellite across the disk of the parent planet. The four main moons of Jupiter can frequently be observed transiting its disk. The inner moons of Saturn transit its disk at times close to the rings' edge-on presentation towards Earth. transit (4) Passage of an atmospheric or surface feature of a celestial body across its central meridian as it rotates. Observations and timings of these transits provide a means of measuring the body's period of rotation. This information can also be used to determine cloud motions relative to a standard reference frame for features on gas giants (principally Jupiter). See also systems i and ii transit instrument (transit circle, meridian circle) telescope mounted so that it can only move about a fixed horizontal axis in a north-south plane. It can observe objects as they cross (transit) the meridian in order accurately to determine their positions. The simple transit instrument consists of a telescope fixed at right angles to a horizontal axis and free to rotate upon pivots on two fixed piers. The telescope can thus be moved up and down from horizon to horizon via the zenith, but not from side to side, so that its optical axis will always be in the plane of the observer's meridian. A star or other celestial object is observed using cross-wires in the eyepiece of the transit instrument as it crosses the meridian and the exact time is recorded. When related to a fundamental reference frame, this time provides the star's right ascension or celestial longitude. Its altitude can be measured directly at the telescope from precisely graduated circles mounted on the horizontal axis and used to determine the star's declination or celestial latitude. transition region Thin region in the solar atmosphere, less than 100 km (60 mi) thick, between the chromosphere and corona. It is characterized by a large rise in temperature from about 20,000 to 1,000,000 K. The plasma density decreases as the temperature increases, keeping the pressure constant. Transition Region and Coronal Explorer (TRACE) Satellite launched in 1998 April to perform the first US mission dedicated to solar science since the solar maximum mission launched in 1980. TRACE takes high-resolution images of the transition region between the Sun's chromosphere and the corona to obtain measurements of the temperature regimes, to complement data being collected by other spacecraft, including the solar heliospheric observatory. Scientists are also interested in the transition region because many of the physical phenomena that are found, such as plasma heating, arise throughout astrophysics. TRIANGULUM (gen. trianguli, abbr. tri) Small but distinctive northern constellation, between Andromeda and Aries. Its three brightest stars, p, a (Mothallah) and 7 Tri, mags. 3.0, 3.4 and 4.0, form a narrow isosceles triangle with a at the apex. 6 Tri is a double star, with yellow and pale yellow components, mags. 5.3 and 6.8, separation 3".9. The brightest deep-sky object is the 6th-magnitude pinwheel galaxy (or Triangulum Galaxy; M33, NGC 598). TRIANGULUM AUSTRALE (gen. trianguli australis, abbr. tra) Small but distinctive southern constellation whose three brightest stars form an almost equilateral triangle, between Norma and Apus. It was introduced by Keyser and de Houtman at the end of the 16th century. Its brightest star, Atria, is mag. 1.9. The constellation's brightest deep-sky object is NGC 6025, an open cluster of about 60 stars fainter than 7th magnitude. Although most TNOs are in near-circular orbits, about 10% of the currently known population have moderate to large eccentricities, with perihelia at 30-15 AU and aphelia at 60-200 AU. These bodies, termed scattered disk objects, have perhaps been pushed into higher-eccentricity orbits by non-collisional encounters with other TNOs. Some such objects may have been scattered into orbits with perihelia inside the orbit of Neptune, whereupon strong perturbations by that and, successively, the other giant planets may pass the objects inwards. The centaurs and perhaps some of the long-period asteroids are thought to have originated in this way. Trapezium Popular name of the multiple star 01 Orionis, which lies within the Orion Nebula and illuminates it. The four brightest components, of mags. 5.1, 6.7, 6.7 and 8.0, form a trapezium shape easily seen with a small telescope. The two faintest stars are spectroscopic binaries with ranges of 0.8 and 0.5 mags. and periods of 65.4 and 6.5 days, respectively. Larger apertures reveal two additional stars in the group, of 11th magnitude. Like the Orion Nebula itself, the Trapezium lies about 1500 l.y. away. Treptow Observatory Public observatory in the southeastern Berlin suburb of Treptow. It is formally known as the Archenhold Observatory in honour of its first director, Friedrich Simon Archenhold (1861-1939). It was built as a temporary structure for the Berlin Trade Exhibition of 1896, and housed a refracting telescope with an aperture of 0.70 m (27 in.) and the extraordinarily large focal length of 21 m (69 ft). A permanent building was erected in 1910, and the telescope is still on public exhibition limit attainable with ground-based telescopes, rather than a real absence of smaller TNOs: sky sampling with the Hubble Space Telescope has indicated that TNOs in the size range 1-10 km (0.6-6 mi) certainly exist. Trifid Nebula The dark lanes in this emission nebula are in fact dust, which obscures the nebula behind. This HII region is pinkish rather than red because of the light of the hot blue stars within it. Formally classed as asteroids (minor planets), the TNOs are probably more similar to comets in nature than to main-belt asteroids, being composed largely of ices rather than rock and metal. Many of the TNOs occupy orbits with periods that are precise multiples of that of Neptune. This relationship leads to stability, as in the case of the orbital periods of Uranus, Neptune and Pluto, which are in the ratio 6:3:2. The plutinos are TNOs residing in the 3:2 resonance with Neptune, as does Pluto. Some astronomers regard the plutinos as being a separate population to the rest of the TNOs, in the same way as the Hilda asteroids are not considered to be part of the main belt. Triana national aeronautics and space administration (NASA) satellite to be stationed in an orbit between the Earth and the Sun; it will return a continuous stream of real-time images of the full disk of the Earth to be viewed live via the Internet, giving people a daily view of their home planet in space. The concept has been expanded to include additional science relevant to monitoring the Earth's environment. Triana may be launched in 2003-2004. Triesnecker Lunar crater (4°N 4°E), 23 km (14 mi) in diameter. It is a complex crater, having side-wall terracing and central peaks. Triesnecker is a relatively recent crater, with a bright ray system best seen at high Sun illumination. From the north-east to the south-east of this crater is an extensive set of rilles; these are likely to have been caused by subsurface stresses, and so are tectonic in origin. Trifid Nebula (M20, NGC 6514) Emission and reflection nebula in the constellation Sagittarius (RA 18h 02m.3 dec. —23°02'). Long-exposure photographs show the reddish emission nebula, illuminated by an embedded O-class star, to be split by three dark lanes, from which the object takes its popular name. The presence of Bok globules indicates that star formation is still ongoing. Bluish (dust) reflection nebulosity lies nearby. The nebula has an overall magnitude +6.3 and angular diameter 20'. It lies 6700 l.y. away. trigonometric parallax Method of determining the distance to a nearby celestial object by making observations from either end of a baseline of known length. Stellar distances are measured using the Earth's orbit around the Sun as a baseline, giving the annual parallax (heliocentric parallax). For objects within the Solar System the radius of the Earth is used as a baseline, producing a measure of diurnal parallax (geocentric parallax). trigonometric parallax If a nearby object (X) is observed from opposite sides of the Earth’s orbit (A and B), it will appear in different positions against the stellar background (X1 and X2). As the distance between A and B is known, the distance to X can be calculated. As the Earth revolves around the Sun the directions to nearby stars change relative to the distant, background stars. When observed six months apart from opposite sides of the Earth's orbit, the position of a nearby star will appear to have shifted by an angle A0. Half of this angle, t, gives the annual parallax, which is equal to the angle subtended at the observed star by the semimajor axis, or radius, of the Earth's orbit, which is one astronomical unit (1 AU). The reciprocal of annual parallax in arcseconds (") gives the distance to the star in parsecs (pc), a parsec being the distance at which a star would have a parallax of one arcsecond, so d = 1/t pc. The star Proxima Centauri has the largest known parallax, at 0".772, which is equivalent to a distance of 1.3 pc (4.22 l.y.). In practice, the parallax of a star is measured from observations taken about six months apart. Allowance is made for the proper motion of the star and the possibility that some of the background stars may also have significant parallaxes. The measurement is deemed 'absolute' when it has been corrected for the parallaxes of the background stars. The astrometric satellite hipparcos, which operated between 1989 and 1993, extended the range of accurate stellar parallax distances by roughly 10 times, at the same time increasing the number of stars with good parallaxes by a much greater factor. triple-a process nuclear reaction that converts helium to carbon by the near simultaneous combination of three a-particles (helium-4 nuclei). The next stage after the production of helium-4 from hydrogen inside stars is not the production of beryllium-8, because that decays back to two a-particles injust 2 X 10~16 s, instead it is the triple-a reaction, producing carbon-12. The triple-a reaction involves two a-particles combining and then a third being added before the beryl-lium-8 can decay. It requires a temperature of about 108 K before it will start because the nuclear reactions involved are slightly endothermic (requiring the supply of energy) and therefore need the input of thermal energy to get them to occur. The triple-a reaction overall is exothermic: more energy is released by the process than is used in starting it, because the carbon-12 nucleus that is the result of the reaction is in an excited state and emits a high-energy gamma ray. Additional helium captures can produce oxygen, neon and a number of heavier elements (see nucleosynthesis). 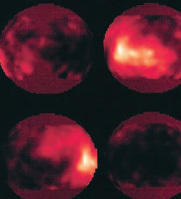 The reaction is believed to be the dominant energy-generating process in red giants. triplet lens assembly made up of three separate lenses that may or may not be cemented together but that work effectively as a single lens. Triplets are used to correct the aberrations that a single lens would produce. One example is the objective of an apochromat; it normally consists of a triplet designed to reduce chromatic aberration to a minimum. An orthoscopic eyepiece contains a triplet lens. Triton Only major satellite of neptune; it has a diameter of 2706 km (1682 mi). Triton was discovered in 1846 by William lassell only a few weeks after the planet itself had been found. Unique among large planetary satellites, Triton orbits its planet in a retrograde direction, with an orbit inclined at an angle of 157° to Neptune's equator. Triton Voyager 2 imaged Triton in 1989, and this mosaic shows some of the varied terrains. The broad area at the bottom of the picture is the southern polar ice cap, which probably consists mainly of nitrogen ice. Triton has an unusually bright icy surface with an albedo of about 0.8. Its density of 2.1 g/cm3 is exceeded among planetary satellites only by io and europa. 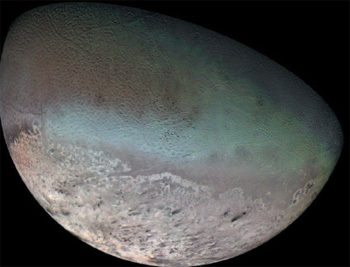 Triton's strange orbit suggests that it did not share its origin with Neptune. It most likely began as a large edgeworth—kuiper belt object, and was later, perhaps about a billion years ago, captured into orbit around Neptune. While Triton was being captured and its orbit made circular, any previous large satellites of Neptune would have been destroyed by mutual collisions or ejected from the Neptune system. It is possible that NEREID and PROTEUS are collisional remnants dating from this time. Triton must have suffered greatly in the aftermath of capture. Even if not involved in any collisions, there must have been much TIDAL HEATING during the circularization of its orbit and while TIDAL FRICTION was slowing its rotation until it became SYNCHRONOUS with its orbital period. Triton's surface is remarkably varied, as revealed on close-up images sent back by VOYAGER 2 in 1989. There are few impact craters, attesting to the young age of the surface. There are many signs of CRYOVOLCANISM, including long ridges, where viscous melts have oozed out, and a large tract, named 'cantaloupe terrain', that is pockmarked by 30-km-diameter (20 mi) dimples. The surface temperature of 38 K makes Triton the coldest body yet visited by a space probe. Spectroscopic observations have demonstrated the presence on the surface of ices formed from methane, carbon dioxide, carbon monoxide and nitrogen. Ammonia, which is almost impossible to detect, is probably present too. The scale of the topographic features demonstrates strength consistent with water ice, and presumably this lies beneath a thin veneer of the more exotic ices. Triton's density suggests that a large rocky core occupies about two-thirds of its radius, and there may be a smaller iron-rich core in the middle. Trojan asteroid ASTEROID that has an orbital period very close to that of Jupiter and is positioned in one of two groups surrounding the LAGRANGIAN POINTS located 60° in front of (L4) and behind (L5) the planet. After numbering, these objects are generally given names associated with the heroes of Homer's Iliad, the leading set being the Greek warriors and the followers being the defenders of Troy. By 2001 more than a thousand such Trojan asteroids had been discovered, 62% of them at L4 and 38% at L5. Trojan asteroid The asteroids known as the Trojans orbit at the Lagrangian points in front of or behind Jupiter. They oscillate around these points over a period of 150–200 years. Unlike most other planet-crossing objects, the Trojan asteroids are dynamically stable, being protected from close approaches to Jupiter by their resonant orbits. It is believed that most of them have occupied their present locations since they formed from the SOLAR NEBULA at the same time as the rest of the solid bodies in the Solar System. Trojan asteroids associated with Saturn's orbit have not been found, presumably because Jupiter's gravitational perturbations render unstable the corresponding Lagrangian points for Saturn. There are, however, several MARS-TROJAN ASTEROIDS known. The first Trojan asteroid to be recognized was ACHILLES, in 1906; it was closely followed by PATROCLUS and HEKTOR. It has recently been realised that a Trojan asteroid re-discovered as 1999 RM11 had been previously observed in 1904.
tropopause Name for the temperature minimum that marks the boundary between the TROPOSPHERE and the overlying STRATOSPHERE. It is defined as the height at which the lapse rate (the decline in temperature with height) becomes 2 K per kilometre or less. The altitude of the tropopause varies from 5-8 km (3-5 mi) at the poles, where it is indistinct in winter, to 14-18 km (9-11 mi) at the equator. Although considerable fluctuations occur, the temperature is generally about 218 K at the polar tropopause and 193 K at the equatorial tropopause. troposphere Lowest layer in the Earth's atmosphere: it extends from the surface to the tropopause. The troposphere contains three-quarters of the atmosphere by mass and has the majority of clouds and weather systems. It is heated by infrared radiation and convection from the ground. Within the troposphere, the temperature generally falls with increasing height, reaching the first atmospheric minimum at the tropopause, where the atmospheric density decreases to approximately one-quarter of its sea-level value. Trumpler classification Classification of open clusters using three criteria. The criteria are the number of stars in the cluster, the amount of stellar concentration towards the centre of the cluster, and the range of brightnesses of the member stars. It was devised by Robert trumpler. Tsiolkovskii, Konstantin Eduardovich (1857-1935) Russian rocket pioneer, now justly regarded as the 'father of astronautics'. Between 1903 and 1929 he wrote many seminal papers on fundamental spaceflight technology, such as liquid propellants and multi-stage launch vehicles. Many of his ideas were collected in Investigations of Outer Space (1911) and Aims of Astronautics (1914). Tsiolkovsky Lunar crater (29°S 129°E). It is conspicuously dark as the only large (180 km/113 mi diameter) lava-filled crater on the lunar farside. T-Tauri star These very young stars are still contracting and are all irregular variables. They are extremely luminous and have strong bipolar outflows with speeds of several hundred kilometres per second. Tucana One of the deep-sky objects found in the southern constellation Tucana is the Small Magellanic Cloud. This companion galaxy to the Milky Way is at a distance of about 200,000 l.y lines in their spectra indicating an extended atmosphere of gas; high velocities in outflowing or infalling gas as the stars adjust to the recent onset of nucleosynthesis: association with dark clouds where star formation occurs; and a high proportion of lithium, which is radioactive and quickly becomes depleted in most stars. Many T Tauri stars show evidence of a strong, continuous flow of material from the surface of the star, known as the T Tauri wind. Tully-Fisher relation Relationship between the widths of the 21-cm radio emission line of hydrogen (see twenty-one centimetre line) emitted by giant gas clouds in spiral galaxies to the optical brightnesses of the galaxies. The larger the galaxy, the faster the rotation and the broader the emission line width, and also the brighter the galaxy the more stars it has. This relationship can be used to measure distances to galaxies out to about 100 Mpc. Tunguska event Very bright fireball that was visible early in the morning of 1908 June 30 over the remote Tunguska region of Siberia. Contemporary reports record that explosions like thunder were heard. The first tuning-fork diagram Diagram of galaxy types, originated by Edwin hubble. The 'handle' of the fork consists of elliptical galaxies (E), numbered according to their degree of elongation. The two prongs of the fork are made up of ordinary (S) and barred (SB) spirals, designated a, b, or c according to how tightly wound the spiral arms are. S0 or lenticular galaxies occur at the branch of the fork; they have both nonbarred and barred varieties and share stellar populations with elliptical galaxies. The classification was originally interpreted as a sequence of evolution, with ellipticals developing into spirals, but this is now known to be incorrect. TUCANA (gen. tucanae, abbr. tuc) Small, rather inconspicuous southern constellation, representing a toucan, between Indus and Hydrus. It was introduced by Keyser and de Houtman at the end of the 16th century. Its brightest star, a Tuc, is mag. 2.9. p Tuc is a multiple star with bluish-white components of mags. 4.4 and 4.5 (separation 27") and mag. 5.2 (10' to the south-west). Tucana's deep-sky objects include the small magellanic cloud and the 4th-magnitude globular cluster forty-seven tucanae (NGC 104). Turner, Herbert Hall (1861—1930) English astronomer who greatly advanced the precise determination and cataloguing of star positions. Turner was Savilian Professor of Astronomy at Oxford University (1894—1930), and a leader of the international carte du ciel photographic sky survey, which occupied him from 1887 to the end of his life. To expedite this massive undertaking, which required the Oxford astronomers to measure over 400,000 star images, Turner invented a measuring engine which replaced the usual micrometer screw with an eyepiece scale, greatly speeding up data analysis. He was the first to make use of the coelostat to observe solar eclipses, obtaining some of the first detailed spectra of the inner corona. turnoff point Point on the hertzsprung-russell diagram (HR diagram) where a star evolves off the main sequence. The turnoff point depends on the initial stellar mass: both luminosity and temperature of the turnoff point increase with stellar mass. Stellar age also depends on the initial stellar mass: the more massive the star, the quicker it burns its core hydrogen and the shorter time it spends on the main sequence. Plotting stars belonging to a globular cluster on an HR diagram gives a distinct turnoff point which can be used to determine the age of the cluster. Tuttle, Comet 8P/ Short-period comet originally discovered by Pierre mechain on 1790 January 8. The comet was re-discovered on 1858 January 5 by Horace tuttle, and over the next two months sufficient observations were obtained to confirm its identity with the 1790 object. It was successfully recovered in October 1871. The orbital period is 13.51 years, and 8P/Tuttle was last seen in 1993. The comet is the parent of the ursid meteor stream. twenty-one centimetre line emission line of neutral hydrogen in interstellar space, resulting from the energy difference between two sublevels of the lowest energy state of hydrogen. The line at 21 cm (1420 MHz) lies in the radio wave region of the electromagnetic spectrum. If a hydrogen atom is in the upper sublevel, its electron and proton have their spins aligned in the same direction. There is a small probability that the spinning electron will flip over so that the spins are in opposite directions, and this change emits a photon at 21 cm. The existence of the 21 cm line was predicted by Hendrik van de hulst in 1944, and was discovered by him and others in 1951. Neutral atomic hydrogen will be in its lowest possible energy state in interstellar space, and it is this that can be mapped using the 21 cm line, to show the distribution of hydrogen gas throughout the Galaxy. Radio waves penetrate the interstellar dust with ease, and so the 21 cm line can be observed from everywhere in the Galaxy, including the centre and the far side of the Galaxy. The velocity of the gas can be determined, so that the spiral arm structure can be traced (once a model is used to relate how each part of the Galaxy rotates about the centre). twilight Period before sunrise and after sunset when the illumination of the sky gradually increases and decreases respectively. The effect is caused by the scattering of sunlight by dust particles and air molecules in the Earth's atmosphere and its duration is greatest at higher latitudes, being dependent on the angle of the Sun's apparent path with respect to the horizon. Three definitions of twilight exist. Civil twilight begins or ends when the centre of the Sun's disk is 6° below the horizon. This is regarded as the point at which normal daytime activities are no longer possible. Nautical twilight begins or ends when the centre of the Sun's disk is 12° below the horizon and the marine horizon is no longer visible. Astronomical twilight begins or ends when the centre of the Sun's disk is 18° below the horizon; it is the time when faint stars can be seen with the naked eye. Two Micron All Sky Survey (2MASS) Survey of the entire sky at near-infrared wavelengths, begun in 1998 and due for completion in late 2002. It uses two dedicated automated 1.3-m (51-in.) telescopes, one at Mount Hopkins Observatory and one at Cerro Tololo Inter-American Observatory, Chile. The objectives of 2MASS include producing detailed views of the Milky Way unobscured by dust, and an all-sky catalogue of over a million galaxies. 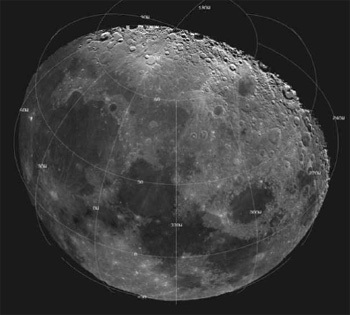 Tycho Lunar crater (43°S 11°W), 87 km (54 mi) in diameter. Tycho is a complex crater with side-wall terracing and central peaks. This recent crater has a bright ray pattern, extending out for hundreds of kilometres. Extensive secondary impact fields are visible in the surrounding terrain. The ejecta appear dark, probably from minerals dredged up in the cratering process. Tychonian system geocentric theory of the Universe suggested by Tycho brahe in 1583. After the publication of Copernicus' heliocentric theory in 1543, astronomers were divided between the ptolemaic system and the new copernican system. While the Earth-centred Universe seemed to accord with common sense and the geocentric physics of aristotle, placing the Sun at the centre accounted straightforwardly for the planets' retrograde motions and other phenomena. Tycho, a great admirer of Copernicus, realized that the question could be decided only by acquiring better observational data, and he developed instruments with which angular measurements of unprecedented accuracy could be made. However, Tycho could detect no parallax or any other sign of the Earth's motion in space. He therefore devised a cosmology that kept the Earth immobile at the centre of the Universe, but with the Moon and Sun revolving around it, and all the other planets revolving around the Sun. This was an ingenious compromise: his solar centre of planetary motion incorporated Coperni-can explanations of the retrograde motions, while his fixed Earth explained why heavy terrestrial bodies fall downwards. The Tychonian system soon gained many adherents. Although rejected by Galileo, it could still explain such Galilean phenomena as the phases of Venus. Not until after 1670 did the weight of observational evidence swing decisively from the Tychonian system towards the Copernican. Tycho's Star First supernova whose position and changing brightness were accurately estimated, with important observations having been made by Tycho brahe. It appeared in Cassiopeia in 1572 and was visible for 18 months. It was historically significant for the development of astronomy because it demonstrated that changes could (and did) occur in the heavens.